DETROIT (Bloomberg) -- After ceding the top spot for U.S. luxury car sales for more than a decade, Mercedes-Benz is plotting a comeback with new and updated sport-utility vehicles. The German automaker said its U.S. deliveries gained 18 percent this year through May, to 106,364 luxury vehicles. That puts Mercedes just ahead of rival BMW, which last year stripped Lexus of the U.S. premium crown that the Toyota Motor Corp. unit took from Mercedes in 2000. "Mercedes has upped its game," said Rebecca Lindland, an analyst with researcher IHS Automotive. "The refreshes and redesigns they've done on their sedans are going to be very nicely complemented by the work they've done on their trucks." Mercedes has gotten a lift from a new M-class SUV, a new C- class coupe and a refreshed C-Class sedan, all introduced last year. In August, an updated GLK compact SUV will reach American showrooms, to be followed in September by a new GL-class large SUV. The U.S. contest may reverberate as BMW, Mercedes and Volkswagen Group's Audi fight to be the world's best-selling luxury brand. Mercedes sold 531,382 vehicles globally through May, making it No. 3 behind BMW, which had 607,207 deliveries, and Audi with 600,200, company data show. BMW said its luxury sales in the U.S. rose 14 percent through May to 104,779 cars. Ludwig Willisch, head of BMW's U.S. operations, has predicted the brand will remain No. 1 this year with the introduction in February of the redesigned 3 series. An all-wheel-drive version of the 3 series and the new X1 small SUV goes on sale in the U.S. in the third quarter, all of which should boost BMW sales during the second-half of the year. BMW's Mini brand and Sprinter vans and Smart cars made by Mercedes' parent, Daimler, aren't included in luxury car sales figures. For the year, Mercedes' U.S. sales may rise 10 percent to a total of 270,000-plus while BMW may increase 4.9 percent to about 260,000, said Jeff Schuster, senior vice president of forecasting with market researcher LMC Automotive in suburban Detroit. "It boils down more to probably the number of models that have some freshness to them within the Mercedes-Benz line up versus the 3 Series," Schuster said. Lexus's U.S. sales slid 13 percent in 2011 as production slowed in the wake of Japan's tsunami and earthquake, opening the way for BMW and Mercedes to bump the brand to No.3 in the U.S. This year, Lexus is aiming for a 25 percent increase in U.S. sales, to 250,000 vehicles, which would be its best year since 2008. The gain would come from replenished inventories and new versions of the top-selling ES sedan and RX crossover that are just going on sale. Lexus's deliveries through May increased 14 percent to 88,110. Executives of the brand have said they don't expect to regain the top luxury vehicle spot in the U.S. this year. Steve Cannon, CEO of Mercedes-Benz USA, stopped short of saying Mercedes would end the year in the top position. "We are outpacing all of our competitors, we've got great new products to launch," Cannon said. "If at the end of the year the luxury sales crown happens naturally, that's great." The company next month will let reporters test drive the 2013 GL, replacing a version introduced in 2006. The new model will come with standard safety features and options such as parking assist and surround-view cameras. While pricing for the GL hasn't been announced, the current generation starts at $61,570. Mercedes has had success with the redesigned M-Class, which starts at $48,990. Deliveries of that vehicle gained 60 percent this year through May, to 17,735. "We've seen this amazing bump between the outgoing M-Class and the new M-Class, that's a really hot product right now," Cannon said. "I'm expecting exactly the same kind of market reception for the GL." Mercedes sold 25,139 GLs and 24,310 GLKs last year in the U.S., according to researcher Autodata Corp. The GLK, starting at $37,090, competes against one of BMW's most important vehicles, the X3 SUV, which sold 27,793 units last year after a redesign. The updated GLK comes with almost 1,000 new parts, a brawnier exterior and a refined interior, said Todd Grieco, Mercedes' product manager for SUVs in the U.S. While the GL's style and accessibility should appeal to families looking for more space, the GLK's redesign--especially the body's contours--might not be sufficient to attract many new customers, IHS's Lindland said. 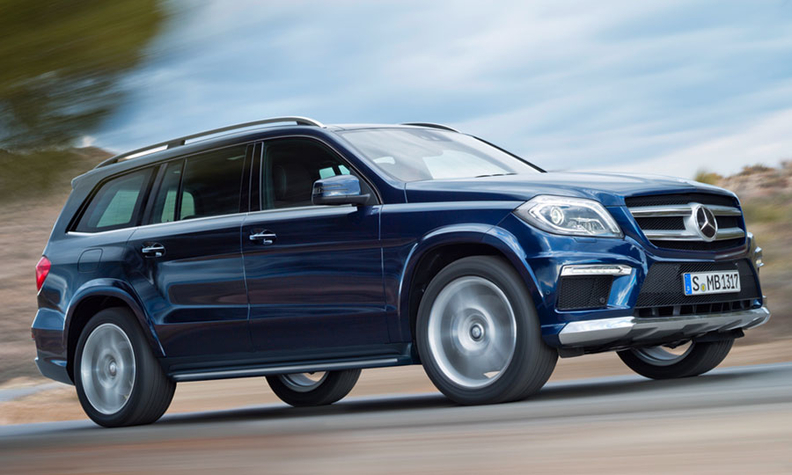 The GLK's "exterior styling still may not suit many people," she said. "It still looks like a Subaru." The new interior on the GLK, by contrast, is a winner, she said, especially the circular, chrome air vents that dominate the front dash. "You don't really appreciate all of the differences until you've looked inside," Lindland said. "Who knew that you could fall in love with vents?"